We provide the essentials include a non-tangling lead; a body harness (attaching the lead to only a neck collar could be dangerous; we attach the lead to a fitted body harness instead); a brightly colored reflective vest for your dog (we may also apply reflective tape to your dog’s vest); blinking lights for your dog and our bike (we may use a collar that has lights embedded in it, or use an attachable tag sized light); a small first aid kit for little nicks that can occur; an extra lead for detaching your dog from the bike to do other things; and water bottles for you and your dog. Extras that can make the ride more enjoyable are dog booties — hiking grade to protect your dog’s feet from jagged objects and from slippery or hot (or cold) concrete; a bike lead “baton” that can be attached to the body of the bike to hold the lead — and the dog — away from the bike’s wheels (as opposed to holding the lead up by the handlebars); reflective rain gear or cold weather cover-ups for inclement weather; and a dog backpack so your dog can carry her own water bottle and treats. If your dog has never been around your bike before, we start off by walking the bike along with the dog — us on one side and your dog on the other — just to get her acquainted with being attached to the bike. If possible, we try to use paths that are soft, like grassy or dirt paths. Don’t expect your dog to be able to run for long distances in the beginning. Just like us, dogs need some time to acclimate to an exercise routine. We start off by riding at a walking speed on an easy path for a short distance. As she gets used to this over a week or two, we build up to a trotting speed after a ten minute warm-up walk. We observe your dog at all times and stop immediately if he appears tired, is panting heavily, drooling excessively, or loses coordination. If he seems to be slowing down, we stop and allow her to rest and have a drink. Remember, this isn’t a race. 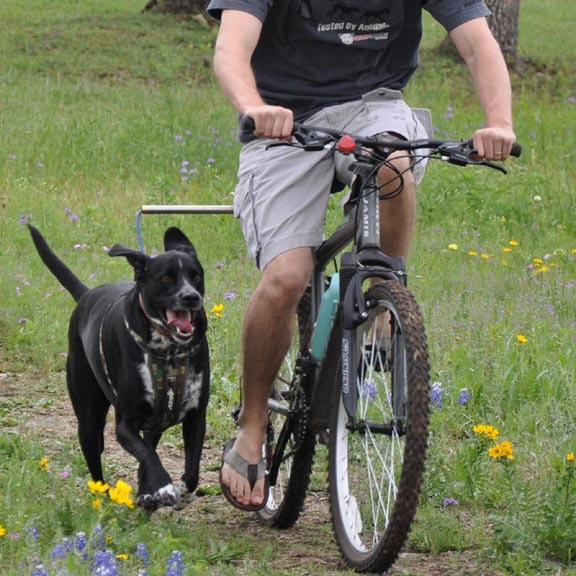 We pedal at a pace that will allow your dog to keep up with us easily. We watch your dog closely. Any distraction (another dog, animal, or person) that causes your dog to pull away can cause both of us to take a tumble. During the ride and when we take breaks, we give your dog lots of praise for being a good biking partner. Maybe even a little treat. Have a dog that could benefit from some extreme exercise? Does your dog have separation issues and goes nuts when you leave the house? Working off that energy helps them coupe with being left alone in a house with no humans.